205 Beacon is located on the south side of Beacon, between Clarendon and Dartmouth, with 278 Clarendon to the east and 209 Beacon to the west. 205 Beacon was designed by Peabody and Stearns, architects, and built in 1874-1875 for merchant, cotton manufacturer, and real estate developer Charles William Freeland, probably for speculative sale, one of two contiguous houses (205-209 Beacon) designed as a symmetrical pair. 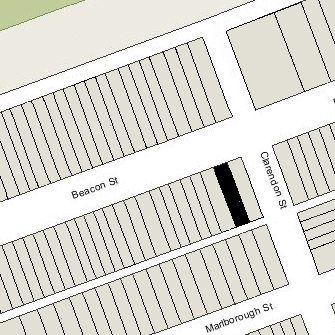 Charles Freeland is shown as the owner on the original permit for 205-209 Beacon (identified as 205-207 Beacon), dated October 14, 1874, and on an amendment dated July 13, 1875, adding a one-story, 30-foot wide wooden shed at the rear of both properties. Charles Freeland previously had built five contiguous houses to the west at 211-213-215-217-219 Beacon ca. 1866; those houses were designed by architects Ware and Van Brunt. Charles Freeland purchased the land for 209 Beacon from the Commonwealth of Massachusetts on April 28, 1874. He purchased the land for 205 Beacon on December 7, 1875, after the house had been completed, presumably under an earlier purchase agreement with the Commonwealth. Click here for an index to the deeds for 205 Beacon. On March 21, 1875, 205 Beacon was purchased from Charles Freeland by William Crowninshield Rogers, He was a widower, his wife, Mary Ingersoll (Bowditch) Rogers, having died in September of 1874 in Funchal on the Island of Madeira, following the birth of their son, William Bowditch Rogers. William Rogers had been a shipping merchant in the East India trade prior to the Civil War. In 1861, soon after the commencement of the war, he enlisted in the US Navy and served as an officer until July of 1866. After the war, he did not resume his shipping business. By the 1880’s, he was a banker, probably in association with his brother, Jacob Crowninshield Rogers, who was Boston agent for J. S. Morgan & Co. of London. William C. Rogers and his son, William Bowditch Rogers, continued to live at 205 Beacon during the 1886-1887 winter season, but moved soon thereafter to a new home he had built at 233 Commonwealth. On June 1, 1887, 205 Beacon was purchased from William C. Rogers by Charles Francis Choate. He and his wife, Elizabeth Waterman (Carlile) Choate, made it their home. They previously had lived in Cambridge. They also maintained a home in Southborough. Charles F. Choate was an attorney until 1878, when he became president of the Old Colony Railroad. Elizabeth Choate died in October of 1898. Charles Choate continued to live at 205 Beacon and in Southborough. In 1905, he was joined at 205 Beacon by his son-in-law and daughter, Nathaniel I. Bowditch and Margaret (Choate) Bowditch. Nathaniel Bowditch was a stockbroker and also operated a dairy farm in Framingham, which was their usual residence. He was the nephew of Mary Ingersoll (Bowditch) Rogers, the wife of William Crowninshield Rogers. Charles Choate continued to live at 205 Beacon until his death in May of 1911. On February 28, 1912, 205 Beacon was acquired from Charles Choate’s estate by real estate broker and property manager Ezra Munroe Rideout. He and his wife, Georgena (MacAuley) Rideout, lived at 13 Burroughs Place. By 1913, 205 Beacon had been converted largely into medical offices. Several physicians maintained their offices there, and two also made it their residence: Dr. Harry Winfred Goodall, who had lived and maintained his medical office at 213 Beacon in 1912 (where Ezra and Georgena Rideout also had lived in 1910), and Dr. Walter J. Dodd and his wife, Margaret (Lee) Dodd, who had lived at 63 Mt. Vernon in 1912 (he had maintained his medical office at 259 Beacon in 1912). Walter Dodd was a pioneer radiologist, the founder of the radiology department at Massachusetts General Hospital. In about 1916, Dr. Lawrie Byron Morrison, another radiologist and founder of the radiology department at Deaconess Hospital, moved his offices to 205 Beacon. Lawrie Morrison and his wife, Fannie Stella (Rowe) Morrison, lived in Roxbury. Dr. and Mrs. Dodd moved to 374 Marlborough in about 1916, and Dr. Morrison moved his office there as well. Harry Goodall continued to live and maintain his office at 205 Beacon. In March of 1917, Ezra Rideout applied for (and subsequently received) permission to remodel the interior of 205 Beacon. The property remained used primarily as medical offices. 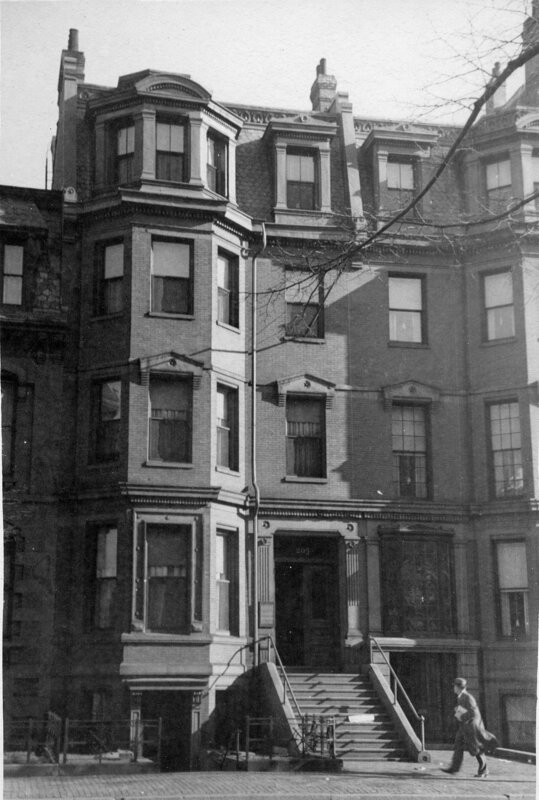 Dr. Goodall continued to live at 205 Beacon in 1920, but had moved to 625 Commonwealth by 1921. He continued to maintain his office at 205 Beacon. On April 21, 1924, Harry Goodall purchased 205 Beacon from Ezra Rideout, and on April 26. 1924, he sold it to Annie (Joanna) J. (Nelligan) Dacey, the widow of James Dacey (Dacy). It remained primarily a medical office building. She lived in an apartment there and managed the building. She previously had lived at 520 Commonwealth, also a medical office building, where she had been assistant manager. Dr. Goodall continued to maintain his office at 205 Beacon until about 1928, when he moved it to 51 Bay State Road (in 1925, he married Mrs. Emma Cornelia (Moore) Pierce; after their marriage, they lived at 138 Beacon). By 1932, 205 Beacon was known as the Waterside Medical Association Building. Annie Dacey continued to live at 205 Beacon until about 1945. On January 30, 1945, 205 Beacon was purchased from Annie Dacey by Clotilda (Murray) Egan, the wife of Thomas H. Egan, and their daughter, Alice Marie Egan. The Egans lived in an apartment at 205 Beacon; she managed the medical building and he was a railway clerk. They previously had lived in Dorchester. Alice Egan married in 1946 to Matthew F. O’Donnell, a cable splicer. After their marriage, they lived in Dorchester. He died in 1949. Clotilda Egan died in May of 1950. By 1950, 205 Beacon was managed by the Mimaur Realty Company. Michael (Max) Lilly, president of Mimaur Realty, was also a partner in the Lilly Construction Company with his father, Harry Lilly, and brother, David Lilly. 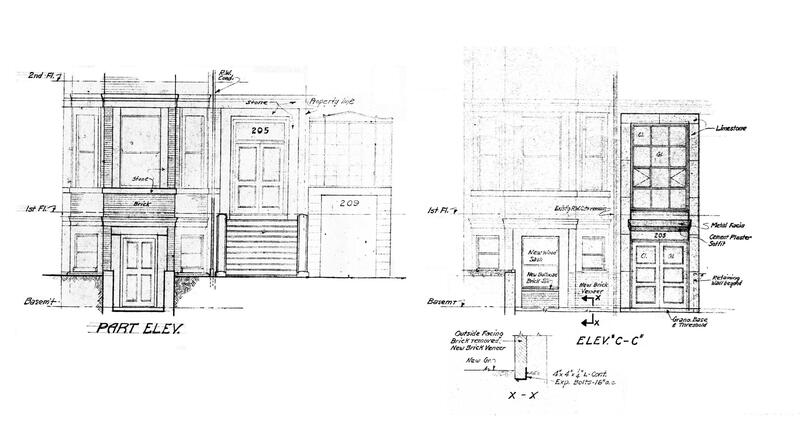 In August of 1950, Mimaur Realty applied for (and subsequently received) permission to remodel the property, lowering the front entrance to street level. The remodeling was designed by architect Archie Riskin. Plans for the remodeling, including partial elevations and floor plans, are included in the City of Boston Blueprints Collection in the Boston Public Library’s Arts Department (reference BIN R-115). Prior to the remodeling, the property had two front entrances, one on the east side of the building entering on the ground floor, slightly below the sidewalk, and one on the west side with a flight of exterior stairs up to the first floor. The remodeling plans proposed converting the door on the east into a window and lowering the door on the west to ground level. A new window with twelve lights was to be installed above that new door, and both were to be surrounded in limestone. The door on the west was lowered, as proposed, but the limestone surround either was built with a much wider margin than shown on the plans or was rebuilt sometime thereafter. Also, the door on the east either was not converted into a window or was converted back into a door by the late 1990s, when it was shown as a door on plans submitted to the Building Department. On July 17, 1952, Mimaur Realty acquired 205 Beacon from Alice (Egan) O’Donnell. The property remained medical offices, and continued to be known as the Waterside Medical Association Building. On April 4, 1956, 205 Beacon was purchased from Mimaur Realty by real estate dealer Samuel Wasserman. 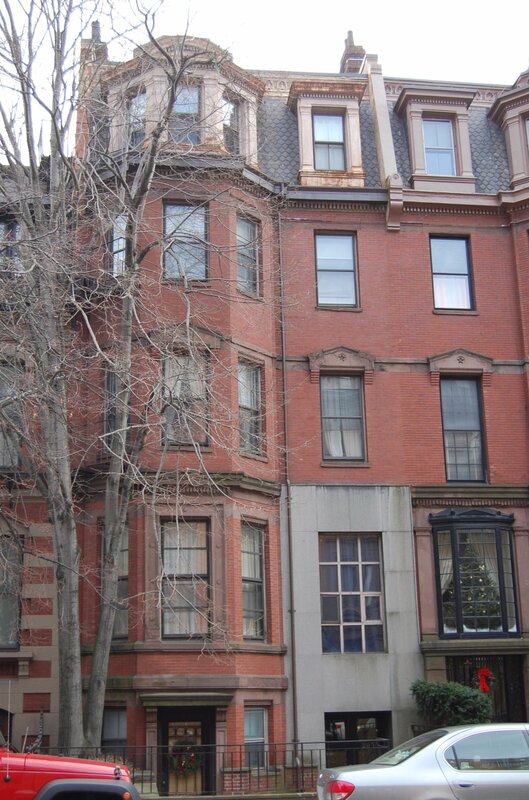 He and his wife, Ella Frances (Brennan) Wasserman, lived in an apartment at 167 Marlborough. In August of 1957, Samuel Wasserman he applied for (and subsequently received) permission to convert 205 Beacon into nine apartments and one doctor’s office. The property changed hands and on January 31, 1967, was acquired by real estate broker and investor George P. Demeter, trustee of the Demeter Realty Trust. On February 1, 1996, he transferred the property to the George P. Realty Limited Partnership. In July of 1998, George Demeter filed for (and subsequently received) permission to legalize the occupancy as eleven apartments, noting that this had been an existing condition for many years. 205 Beacon remained an apartment building in 2016.